Moving at that speed down the court, Russell Westbrook should have been able to spin on a dime the way he did. He should not be able to pass a look over his head behind him in the process. And then it shouldn't have landed perfectly in Steven Adams' hands for an uncontested dunk. 4 points and Westbrook 19. 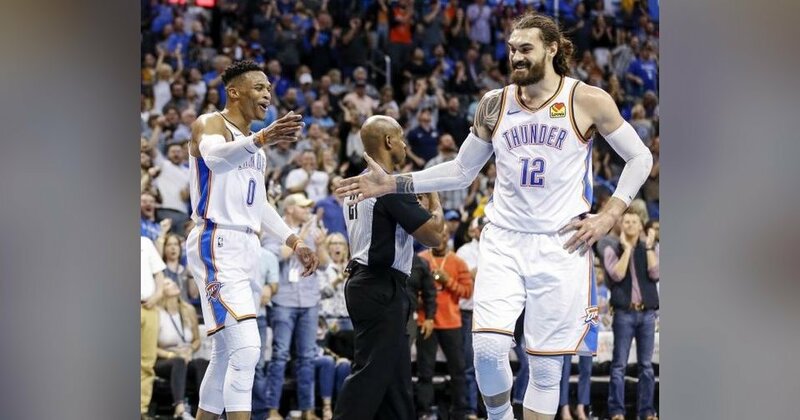 With his first three assists of the game, Westbrook also clinched a triple-double average for the season, making this the third season he has done so. Speaking of things no one should be able to do. With Friday's victory at Chesapeake Energy Arena, the Thunder (46-33) won two consecutive games just the second time since the All-Star break. "It was our identity," Schroder said. The most flashy play of the night – Westbrook's behind-the-head pass – started in transition, the Thunder offense's biggest strength. Two minutes into the second quarter, Schroder drove to the basket and tossed a look at Paul George, who made the layup en route to a team-high 30 points. Three possessions later, he broke a pass through to Markieff Morris for a dunk.